within seven days, saving you time and labor. Simply screw on or unscrew the air-hose and the system is ready to go….Did we mention that you can do all of this with one hand? The included Z8 airbrush station for ZeroG allows the artist to switch between colors using one hand when using 8 color cartridges. Additionally, the holder can hold and safely transfer up to 16 colors and 2 airbrushes. With set up and break down time of less than a minute, this is truly the airbrush system with ZERO limitations. EBA 8 gun system comes with the same 6 primary colors as EBA Six Gun System and additional 2 airbrushes that can be used to add extra colors or ProEndura clear coat. For high traffic locations with multiple employees it is recommended to use 2 black airbrushes as black is the most used color and sharing of airbrushes might slow your business down during peak hours. 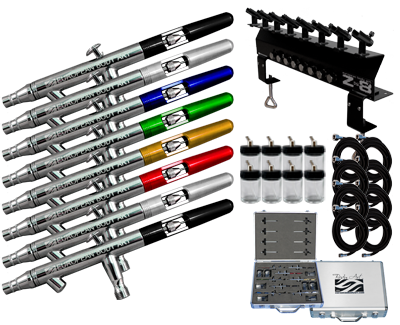 EBA 8 Gun Airbrush System will provide your business with the quickest operation as well as the most flexibility in situations with more than one artist working. Individual guns will provide your business with a faster operation and thus greater profits than the Color Changer at events where speed and dollar value charged per each tattoo design are your trophies.